IPBIS board member Dr Lucia Braga takes Prince Harry from Britain on a tour around her rehabilitation facility in Brazil. The prince was visiting the Brasilia branch of the Sarah network of rehabilitation hospitals which has 10 units based in Brasília, São Luís, Salvador, Brasilia – Lago Norte, Belo Horizonte, Fortaleza, Macapá, Belém, Rio’s Barra da Tijuca –[The Sarah Network Rehabilitation Centres]. The Brasilia hospital treats patients with brain injuries and other neurological problems. 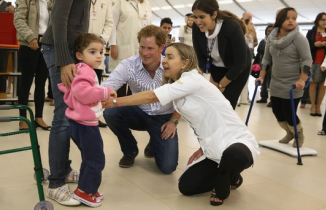 Neuroscientist Lucia Braga, the network's president, had taken the Prince on a tour of the facilities, where he met patients, their families and medical staff as well as watched some of the rehab activities. The SARAH Network "The SARAH Network of Rehabilitation Hospitals offers a Visitation Program for students and professionals interested in getting to know its centers. This Visitation Program includes activities aimed at introducing visitors to the hospital's facilities, equipment, and primary services offered by SARAH Network."